Can you believe that Thanksgiving is next week? That just blows my mind. For all my talk of getting started on Christmas early, I've hardly done anything. Maybe this week I'll get it in gear. 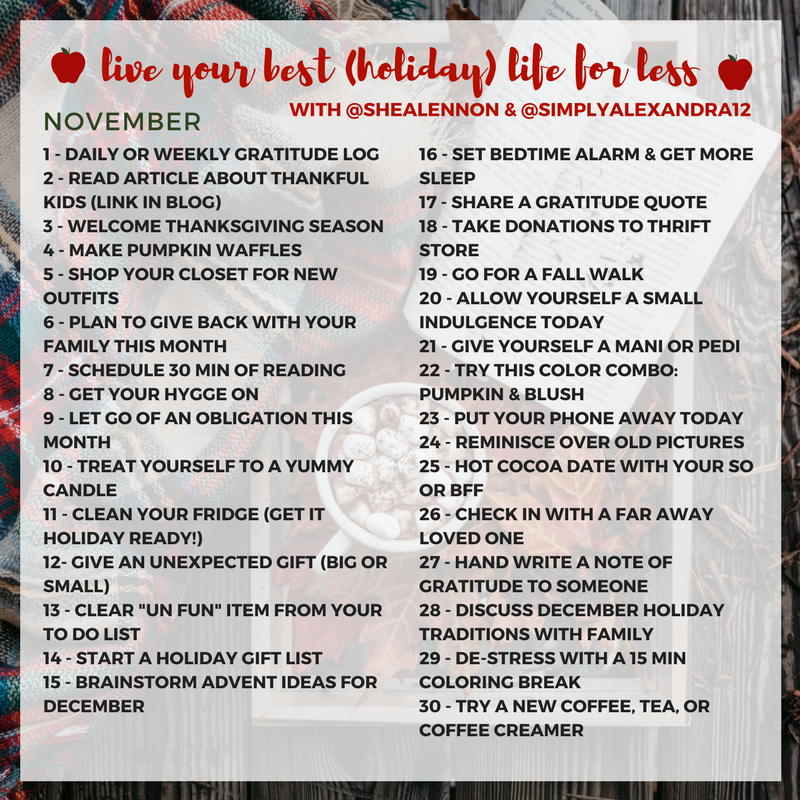 In the meantime, let's talk about this week's Live Your Best (Holiday) Life prompts, shall we? 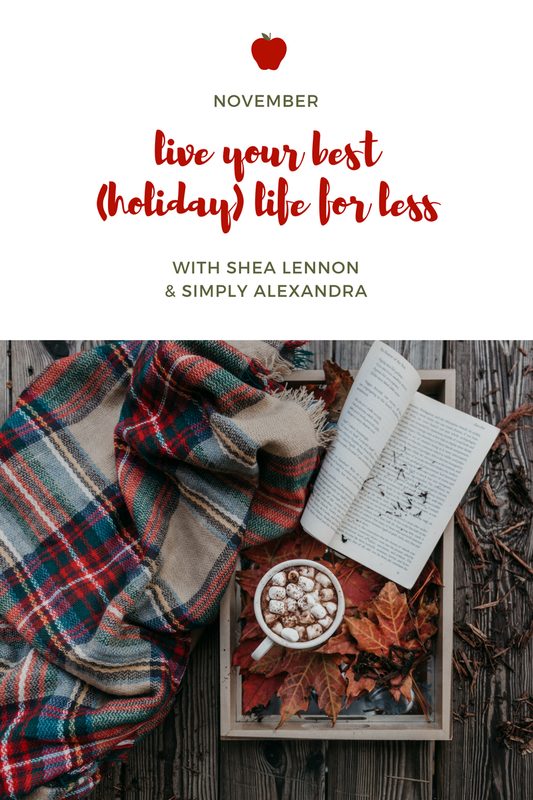 Alexandra, of Simply Alexandra, and I created a challenge for the month of November to help us focus on self-care, contentment, and gratitude this holiday season. Each day we have a prompt to inspire creativity, organization, and a sense of peace during this often crazy month. Every Monday we'll each share the week's prompts on our blogs, with ideas for ways to incorporate them into your life. We'd love for you to join in! You can find the full list of prompts on Instagram, and also at the bottom of this post. Be sure to tag your posts with #LYBHolidayL so we can see them. - Made a plan to take kids shopping for gifts for a child in need. - Got up early a few days this week to read. - Got cozy in the evening and learned about hygge (and other Danish living secrets). - Let go of a few obligations. One evening I skipped making dinner and went on a (necessary, but fun) Target run instead. I also let go of writing a blog post for Friday--I didn't have one ready on Thursday night and I was too tired to put one together. So... I didn't. - Bought an apple scented candle (from Aldi... love that place) to make my living room smell festive. - Cleaned out my fridge to get ready for holiday goodies. - Made some sausage and cheese muffins to share with a friend at work. November 13 - Clear an "un fun" item from your to-do list. I like to do this regularly on Mondays. I feel like Mondays can be bad enough, but they feel worse when I have to do a million things at home after a long day of work. So I do the necessary things, like making dinner, giving the kids baths, etc. but save other tasks, like cleaning and laundry, for another day. November 14 - Start a holiday gift list. For the past few years I've made a Christmas spreadsheet with everyone we plan to buy for, plus what we're budgeting for each person. Despite wanting to get a head start, I haven't bought very many gifts yet. Instead of waiting until last minute and relying on Amazon prime (like last year) I think I'll put down some ideas for every person and then start looking at sales. November 15 - Brainstorm Advent ideas. Making an advent calendar for December is one of my goals for the month, so I need to get started. I want to make mine a mix of activities and little treats. Because Halloween candy created a 4-year-old monster over here, I plan to keep the treats fairly healthy, or make many of them not food at all. November 16 - Set a bedtime alarm and get more sleep. I'm definitely not a night owl, so going to bed at a decent time typically isn't a problem for me. However, lately I've found myself getting sucked into late evening Pinterest browsing, or checking out the new arrivals on ThredUp. Next thing I know it's 10:00. Setting an alarm for bedtime is something I heard on Gretchen Rubin's Happier Podcast and I think it's a great idea. November 17 - Share a gratitude quote. This one's pretty self explanatory and I look forward to finding a good one! November 18 - Take donations to thrift store. I keep a donation bin in our coat closet and it is getting pretty full. It doesn't take very long to take a load to Goodwill or Savers but somehow I rarely remember to do it. November 19 - Go for a fall walk. I hope the weather will cooperate here! With the temperature drop and the short daylight hours, I feel like I haven't spent much time outside. I think my whole family, especially our dog Ellie, will be glad to do this one. 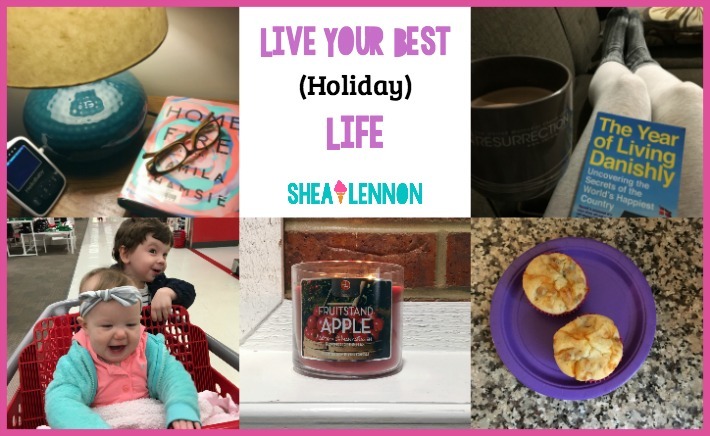 Please join us and be sure to tag your posts with #LYBHolidayL. Have an excellent week!